Generally, there’s not a lot of activity in the field of what you might call Car Battery Culture. Those useful but heavy plastic blocks of reactive chemicals that give our cars the precious 12V they need to start and level the load from the alternator are generally not things that inspire a lot of artistic output. That’s sort of changed now, thanks to the Throwing Your Old Car Batteries Into The Ocean meme/shitposts. This is the world we live in, now. The Throwing Your Old Car Batteries Into The Ocean meme is about throwing things into the ocean, specifically, your old car batteries. That’s pretty much it. It’s technically a pretty terrible idea, of course: throwing old car batteries into the ocean is ecologically terrible, and, let’s be honest, not even that convenient. Lugging heavy batteries all the way to the coast and then hucking them into the sea would be an ordeal. If you really want to get rid of old car batteries in a dickheaded way, it’s much easier to just shove them down your nearest storm drain, for example. Of course, these are shitposts, and as such are supposed to be terrible, because that’s what makes them funny. And, in the usual confusing shitpost way, they are funny. You’ll notice that there’s some recurring themes, beyond the fundamental premise of the aching, fulfilling joy of hucking your old car batteries into the ocean: there’s statements of the act’s legality (which is questionable), and the suggestion that AutoZone is the enemy standing in the way of fulfillment via chucking car batteries into the briny embrace of the sea. According to Know Your Meme, the shitposts got their start on a Facebook group, and from there the memes flowed onto Reddit, Twitter, and now, on here, your globo-network automotinfotainment site of choice, which should make the Car Battery Shitposters happy, I’d think. So, there you go. 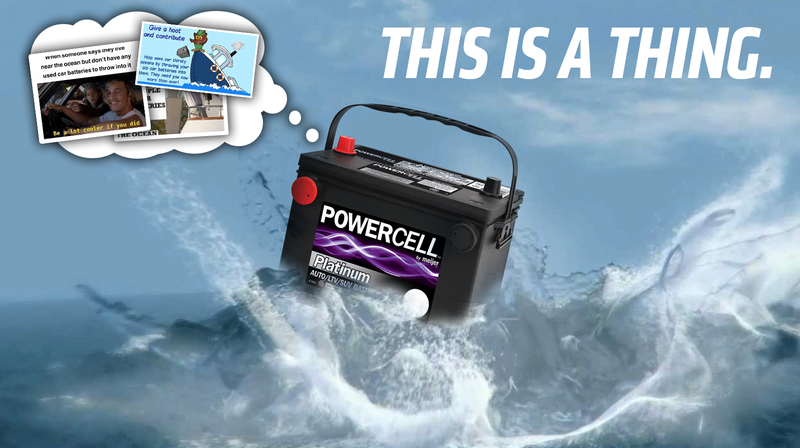 Edited pictures revolving around the theme of throwing your old batteries into the ocean is a thing. For fun, try imagining how you’d explain this to your grandfather.